Years ago, I read an article about a woman my age who did wing walking performances at airshows – and thus showed me that such a thing was *possible*. I watched all her videos and soaked up as much as I could … until the day her plane crashed during a performance and she was killed. As I watched the video of her crash, I felt like I could “see” her spirit leaving her body, and felt something land, right in my heart — a feeling like a passing of a torch. I knew in that moment that one day, I too would be sitting on the wing of a biplane in flight, inspiring people to dream big and go beyond their perceived limitations, just as she had done for me. This spring, I realized that it was time for me, too, to stop saying “one day” and JUST DO IT — even if I didn’t have a clue how or even where to begin to pursue this. But the moment I DECIDED I would do it — I stepped into being the person who did it. And the first thing that shifted was my habit of “kinda sorta” working out but not every day and not always at 100% and being pretty undisciplined about my fitness. But to claim THIS — my deepest desire and dream — and BE the woman who walks on the wing, meant getting serious. I didn’t want to just be on the wing, I wanted to feel strong in my body out on the wing, confident in my body’s ability to dance with the wind in any way that I chose. So I got fired up. And started working out like a badass — every workout feeling myself out on the wing, feeling strong in my body, imagining how I’d feel to be living my boldest dream, getting to the gym not because I “should” but because I genuinely wanted to. 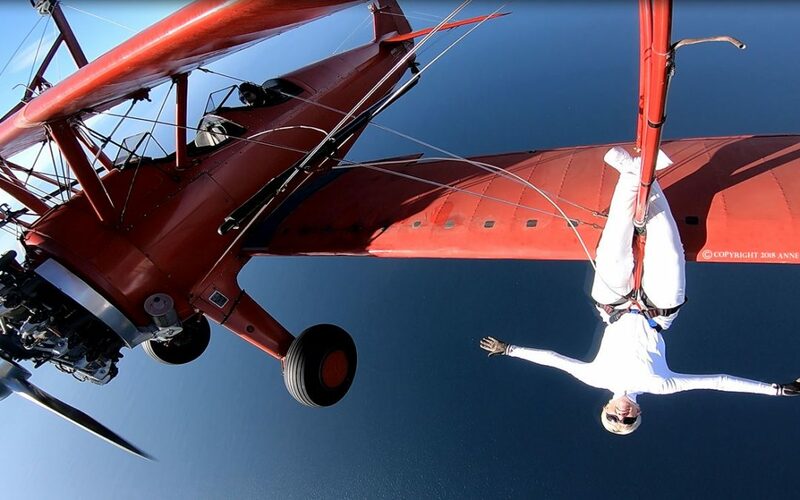 This weekend I got to live my ultimate wing-walking dream — not just “walking” on the wing but hanging upside down. Not only did I feel strong in my body, I felt relaxed. Comfortable. At ease. Totally at home. As if I could have flown around the sky all day like this. And I felt so, so proud that I’d had the discipline to do all the workouts I’ve been doing, so that when it came to do THE SIT UP THAT REALLY MATTERS, I could get myself back up onto the wing. It’s the BIG WHY that gave me the *spark* to engage in new habits that I was otherwise too undisciplined to persist with. We’ve got to have a bigger purpose to guide us. This is where the word “inspiration” comes from — because the purpose truly “IN-SPIRES” or breathes LIFE into our daily choices. It’s one thing to feel “motivated” to take action. It’s quite another to feel genuinely, authentically INSPIRED to do the things that actually move the needle on changing our lives. And when we discover it’s possible that a seemingly small choice made today, actually adds up to a life-changing choice that transforms not only our own experience but possibly touches the lives of others — then the seemingly small choices feel easier, more inspired, more aligned… even on days when we’d rather not get up and do the effing situps. There was NO WAY IN HELL I was going to fall off the wing. Apparently it took very high stakes to get me to start doing my core workouts on a regular basis, haha! But I’m no different than any of us — we humans have a default setting of “resisting change,” because let’s face it, change feels hard, it’s a lot of work, and we are wired to conserve energy and do what is the easiest. You don’t have to hang from the wing of an airplane in flight, but there’s SOME reason that’s very real, that really, really, REALLY matters to you. Go deep and discover what that is for you. And then you’ll find your mojo — the inspiration to do what it takes to uplevel that area of your life that’s, ahem, calling for attention.